Removing an employee card is done from the employees module and is available according to the user authorizations. Usually this option is used after the employee leaves the organization or after canceling a public resource. This can be done by choosing the required employee / public resource from the employees card list and pressing the Remove button, in this module. 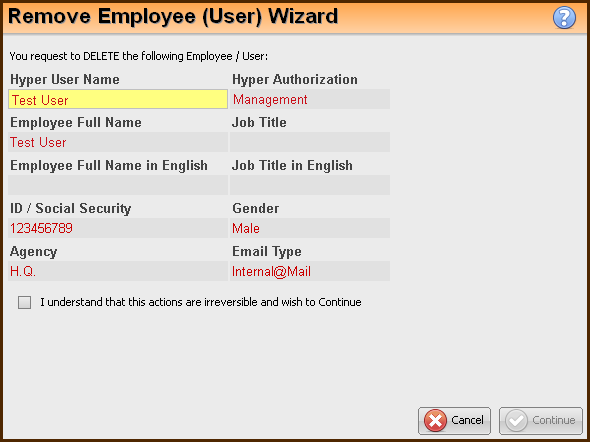 In the Remove Employee (User) Wizard, the personal details of the employee are displayed. Check these details in order to verify that this is the required employee card to be removed. Since this is an exceptional action, the system requires an additional confirmation in order to continue and execute the employee card removal. Use the check box to confirm this action and allow Hyper to remove the employee card. Please note - This action is irreversible. Hyper was design to maintain the organization activity and allow the different departments of the organization a continuous and fluent work, even after an employee leaves. 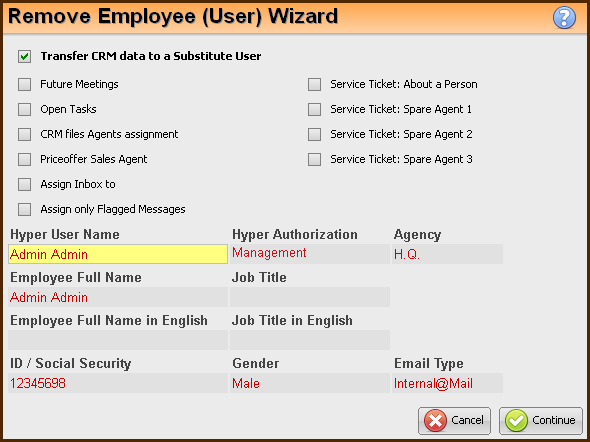 Therefore Hyper allows to transfer the employee data to other employee. Press the check box: Transfer CRM data to a Substitute User. After choosing the required employee, the check-boxes of the wizard will become available. Mark the check-boxes of the required activities to be transferred to the substitute user. Please note - by choosing the "Assign Inbox to" check-box, the user will be asked to select an employee that will receive the inbox messages. This employee can be different from the selected substitute user. This action will transfer only the exist inbox messages and will not forward any future incoming messages. Use the "Assign only Flag Messages" check-box, in order to transfer only important or relevant messages that have been flagged. In an exceptional case, when a restoration of an employee card is required, use the DB Maintenance. The restoration of meetings, assignments, related clients etc., is available only in case that this information has not been transferred to a substitute user.